Paul Fraughton | Salt Lake Tribune Team Vesco's Turbinator II on the Salt Flats. 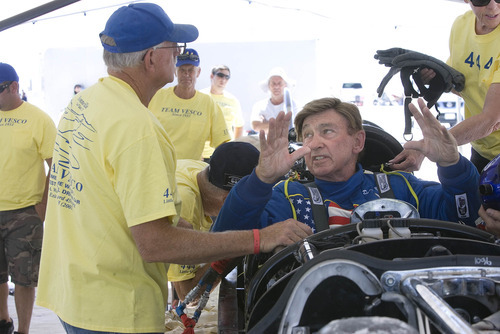 photo credit Rikki Scott Paul Fraughton | Salt Lake Tribune Rick Vesco talks with driver Dave Spangler as the team makes minor adjustments before thei Paul Fraughton | Salt Lake Tribune Team Vesco's Turbinator II on the Salt Flats. photo credit Rikki Scott Paul Fraughton | Salt Lake Tribune Team Vesco works on The Turbinator in preparation for its run on the flats. Rick Vesco is hoping this is the year what he calls "The Salt Flats Gods" put their blessing on his famed Turbinator&apos;s attempt to be the first wheel-driven car to pass the 500-miler per hour mark during the Salt Flats racing season. Team Vesco Racing, which traces its lineage back to the 1930s when father Johnny began building fast cars in southern California, is based in Rockville near the entrance to Zion National Park. Rick Vesco, son of Johnny and brother of the late Don Vesco who set the fastest time ever recorded on the Top Speed Hot Rod Trophy of 459.021 miles per hour in 2001, said Friday the team plans to bring the car to the Utah Salt Flats Racing Association Test and Tune event at the Salt Flats on July 11 to 13 at Bonneville. Organizers said that event is not open to the public. A three-mile course has been set up to allow drivers who plan to participate in big events such as Speed Week, the World of Speed and the World Finals that come later in the summer a chance to test and tune up their cars. 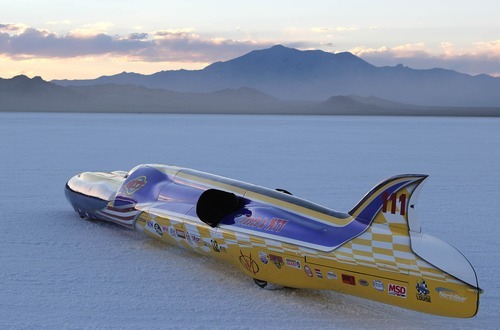 Speed Week, which draws land speed enthusiasts from all over the world, is scheduled Aug. 9 to 15 this year at Bonneville. We want to make sure our cars are ready," said Rick Vesco Friday from his Rockville shop. "I&apos;ve corrected everything we think we had issues with and have fixed up some other stuff. We will get ready and, after the next meet, if we don&apos;t do good, we will regroup and do it again." Vesco said the competition to be the first to reach that elusive 500 mile per hour mark is intense with a number of teams on the Salt Flats capable of setting a new record or reaching that plateau. George Poteet and Ron Main&apos;s Speed Demon has come close to besting Vesco&apos;s 2001 record in recent years. "There are some guys with nice cars," he said. "But there are so many bugs to work out. All it takes is the combination to be right. I have no doubt that there are cars capable of doing it. It&apos;s just a matter of all the Salt Flats Gods lining up and everything working right." The Turbinator is powered by a helicopter engine. It will be driven by Dave Spangler, a 300 mile per hour club member since 1995 and longtime Team Vesco member. "We&apos;ve got as good a chance as anyone," said Vesco. "Everything we knew we had wrong years ago has been fixed. We&apos;ve added more air to the engine and more horsepower. There are a lot of things that should add up. All you could have is wishful thinking. You can dream and dream and do what you can." Driven by Bob Blakely, Team Vesco&apos;s newest member, the Little Giant has added a Liberty 7-speed transmission and new motors in an attempt to set D/Fuel Streamliner and B/fuel class records this year. It currently holds four records. The goal is to run at a top speed of 344.114 miles per hour.